Elmer Ernest Roper was born in Ingonish, Nova Scotia in 1893. His family moved to Calgary in 1907, where he apprenticed as a printer and worked for the Calgary Herald. He married Goldie Bell in 1914 and the couple would have four children. In 1917 he became pressroom foreman for the Edmonton Bulletin. He started several businesses, including Commercial Printers Limited, Comset Business Forms Limited, and plastic Platemakers Limited. Elmer Roper was active in the Labour movement. He was President of the Calgary Trades and Labour Council in 1916, and was Secretary-Treasurer for the Alberta Federation of Labour between 1922 and 1932. He was elected to the Provincial Legislature in 1942, and served until 1955 as the Leader of the Alberta Cooperative Commonwealth Federation. In 1959 Elmer Roper won the Mayoral election, and did so again in 1961. Following his second two year term, in 1963 at age 70, Elmer Roper retied from politics. He and his wife retired to Victoria, British Columbia in 1975, and both passed away in 1994. Mr. Roper was associated with the Edmonton Community Chest, the Edmonton Rotary Club, the Board of Governors of the University of Alberta, and the Canadian Red Cross Society. He was awarded an honorary degree of Doctor of Laws from the University of Alberta in 1959. 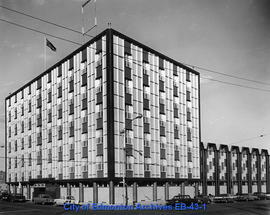 The fonds consists of political papers relating to Dr. Roper's tenure as Mayor of Edmonton from 1959 to 1963. The photographs are from an album, presented to Elmer Roper by Chief Constable M.F.C. Anthony, commemorating the official opening of Police Headquarters Building, October 16, 1962. Speeches, includes proclamations, briefings and other statements. General Correspondence, containing invitations and acknowledgements; complaints and compliments, and general commentaries on civic business; also includes files created by his immediate predecessors as mayor, William Hawrelak, mayor until his resignation in September 1959 and F.J. Mitchell, acting mayor until the municipal election in October 1959. This fonds was donated to the City of Edmonton Archives by Elmer Roper in 1963 and 1970. The textual material was arranged by the archivist by type of record. The photographs were assigned item numbers with the prefix EB-43.